Touching on notions of technological reproducibility, photographic malleability and subjective interpretations, Fabio Morais' two-story solo show at São Paulo's Vermelho gallery is an inquiry into the construction of personal knowledge. The Brazilian artist has placed, duplicated and grouped visually nostalgic and historically dated educational material throughout the exhibition space. 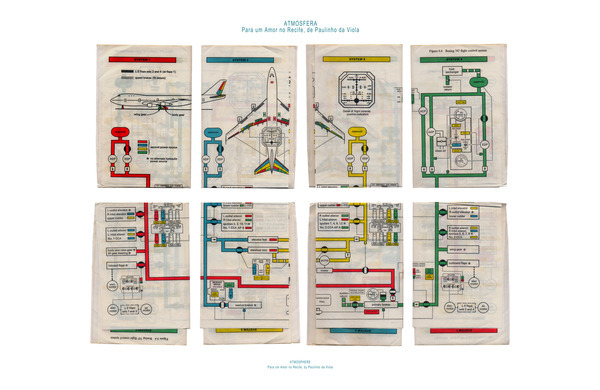 Dating from the 1960s and 70s, Morais' choice of text, image and objects range from the intimate (a grouping of postcards with personal inscriptions) to the political (panels appropriated from a 1978 government issued Atlas of Cuba), to the informative (an instruction diagram of photography light kits). Fabio Morais, ATMOSFERA OF THE SERIES DIDÁTICA DE ENSINO PARA SI MESMO (IN PROGRESS), 2011, inkjet on Canson 310gr paper, 67 x 102,5 x 5 cm; Courtesy Galeria Vermelho. Titled simile-fac, Morais has inverted the Latin term fac simile - an expression that literally translates to "make alike." 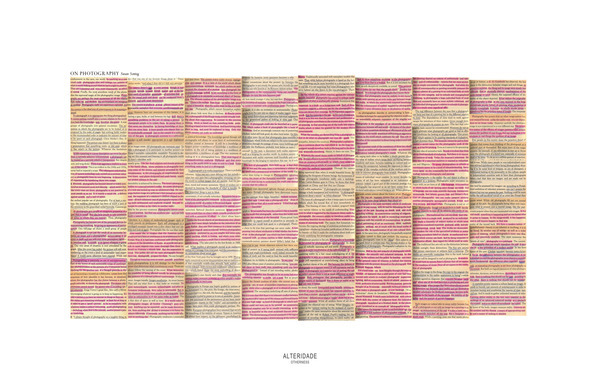 Prior to the advent of mechanical reproduction, to fascimilize something was to produce a duplicate by hand, often a map, book or print, thus creating an authoritative original coupled with a second educational copy. The show's namesake piece plays with this normative transfer of knowledge by juxtaposing a 1960's French flea-market notebook with the same text inscribed on an adjacent chalkboard wall. While this installation mimics the typical passing of information from authority to student (ie: chalkboard to notebook), Morais has coyly inverted this relationship. By transforming the vintage book into the authority and the blackboard into the copy the expected hierarchal relationship by which our cultural knowledge is produced has been subverted. Within the series Didactica de ensign para si memo (in progresso) [A didactics for Teaching Yourself (in Progress)] (2011) the artist has appropriated photography and printed material in a set of formally composed posters that line the upstairs main hall. A photocopied Susan Sontag essay is placed side by side with an airline evacuation manual. Although text and pictorial representation are juxtaposed throughout the exhibition, the ephemera is democratically presented. In doing so the varying signs and symbols highlight both the creation and consumption of social, academic and political data, but more importantly, show the mediation of information as something that is not only subjective but illusionary. 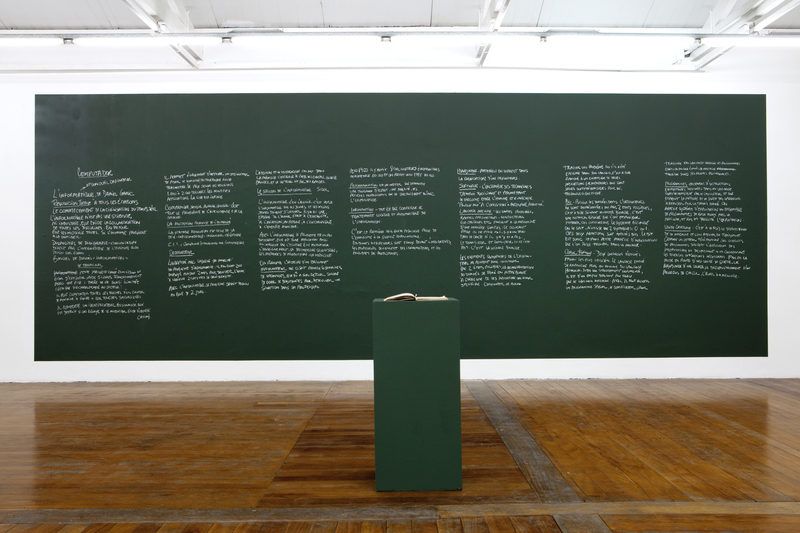 Top Image: Fabio Morais, similie-fac, installation view, 2011; Courtesy Galeria Vermelho / Photo: RAFAEL CAÑAS.